As social media platforms continue to revolutionize the way we share images and inspiration, nail trends have evolved at a rapid pace. 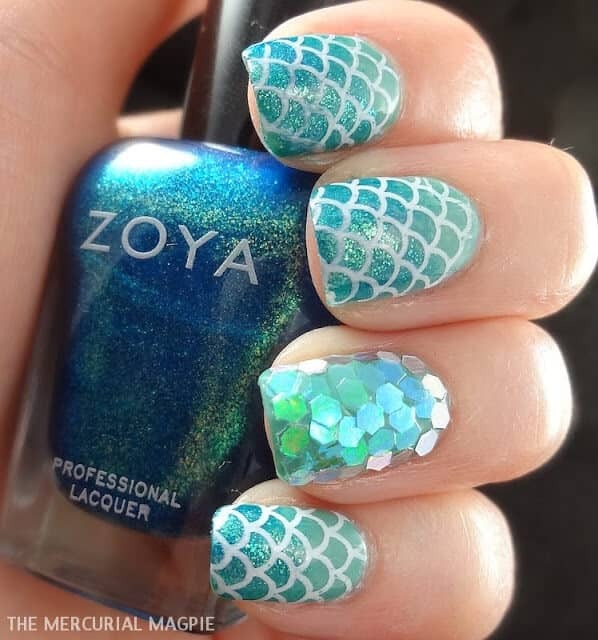 One very popular trend has been Mermaid Nails, which use the pattern of a mermaid’s tail scales to add some fun design and style to your nails. 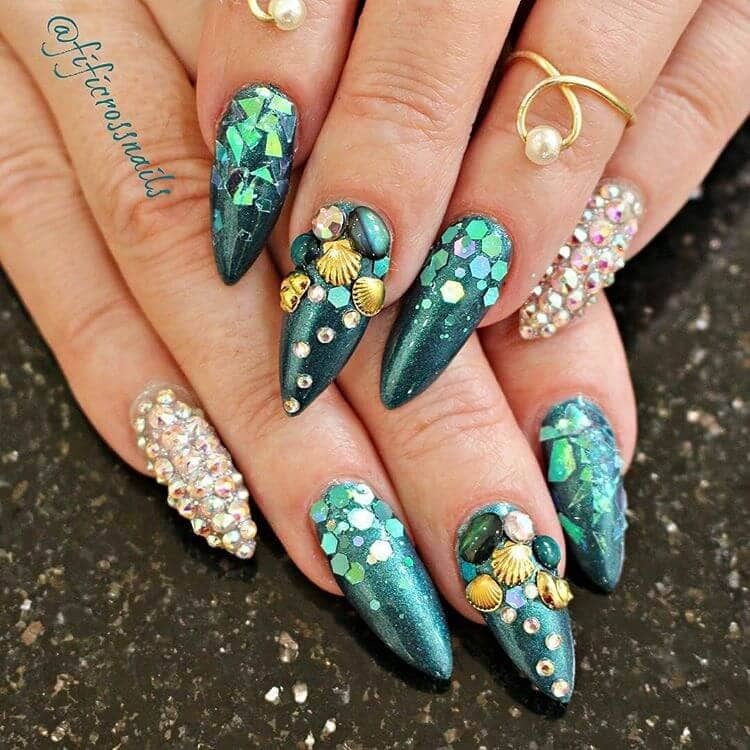 Women especially are huge fans of the mermaid nails, but in our modern digitized world, anyone can express themselves however they like! Whether you’re looking for a glamorous nail look to go with an upcoming party or you just want to experiment with a new manicure type at your next salon visit, the following list has a great range of nail looks to choose from! Especially during seasons like spring and summer when the weather is really warm (or even blazing hot), people love showing off their new style looks. 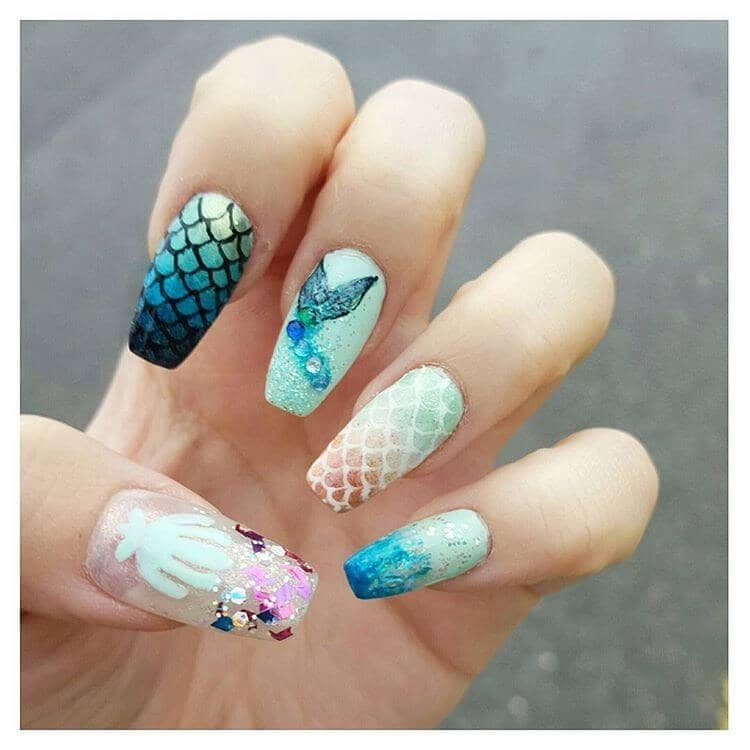 The reason why mermaid nails are so popular is because of the advanced digital sharing of trends by fashion bloggers and leading influencers. 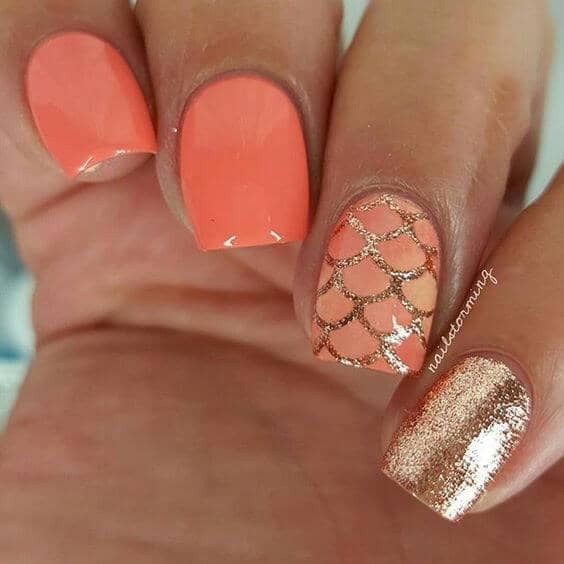 Pinterest creators alike have really managed to share the method of drawing mermaid tail scale lattices to achieve their desired look. You will also frequently notice that you can achieve the look using an ombre method, which simulates the reflective quality of mermaid tails. Mermaids are known to be beautiful, mystical creatures of the sea that have an alluring quality to them. To embrace this feeling of being divine as a human is an exciting prospect and an awesome way for creative people to express their personalities to the world, both online on social media and in real life at gatherings with friends. A beautifully mesmerizing sparkly teal and pale pink combination, these blue sparkly nails are the perfect pop of color to complement a shiny dress for a fun night out with your girlfriends. Adding just a little bit of colorful glitter like you see here can elevate your look by adding a pop of vibrancy and channeling a fun, youthful style. 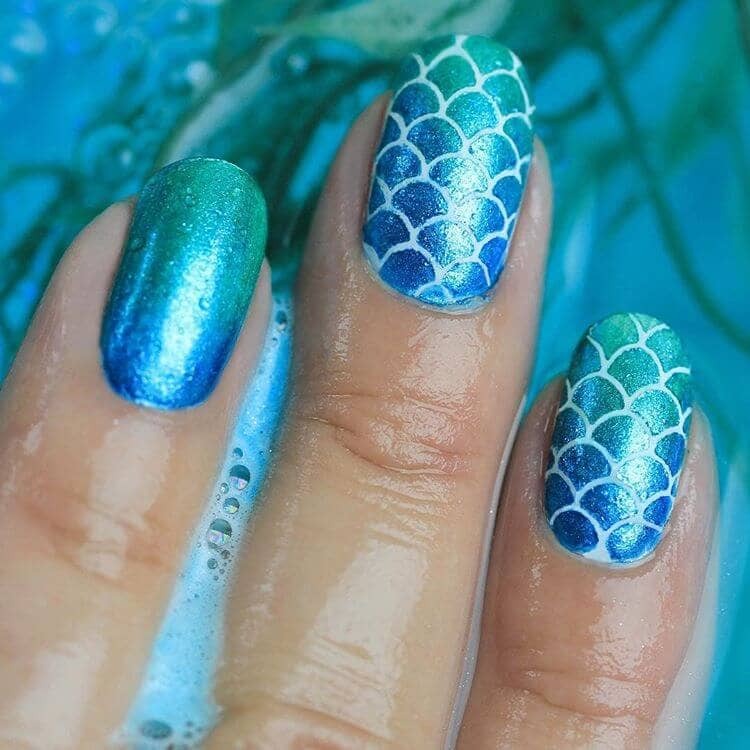 Ombre is all the rage and sporting these beautifully adorned sunset-like mermaid nails will have everyone around you asking for a closer look. If you’re a fan of gems and rhinestones, this look would be great for you! With some sparkle on every nail, you’re sure to stand out and make a fun statement. There’s even a fun coral star! 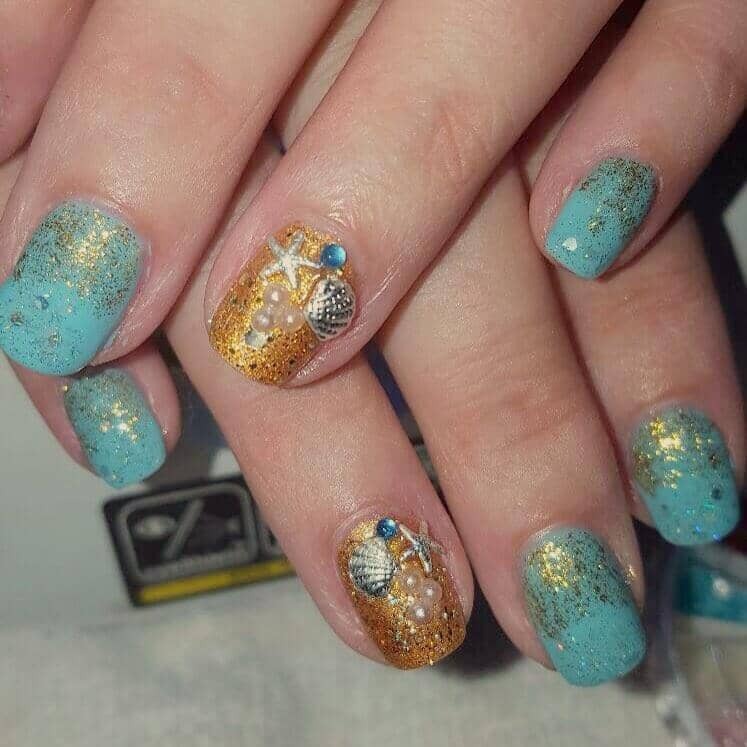 With an alternating, yet unique pattern of blue sparkly nails and white sea-shell tinted coffin nails with gold and blue gems lining the bottom of the three middle names as decorations, this design is one that’s complex yet easy on the eyes. 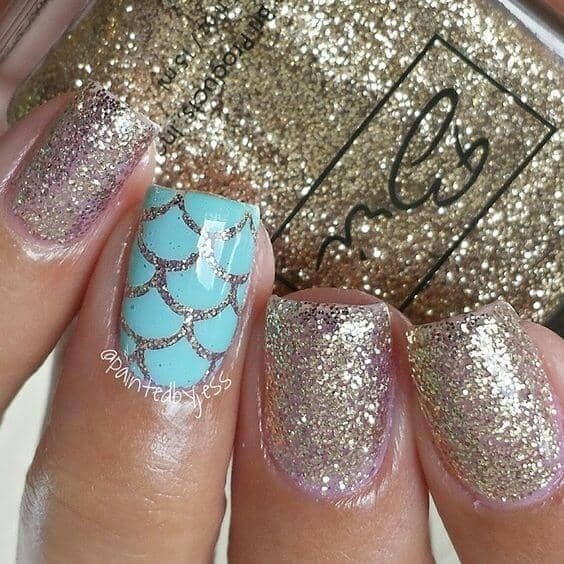 If you like going all out, this nail could be the perfect set of cute glitter nails for you! Incorporating a reflective, metallic style mermaid nail polish with thin black scales painted on top, this uniform design is a show stopper and will fit any modern theme you’re going for. 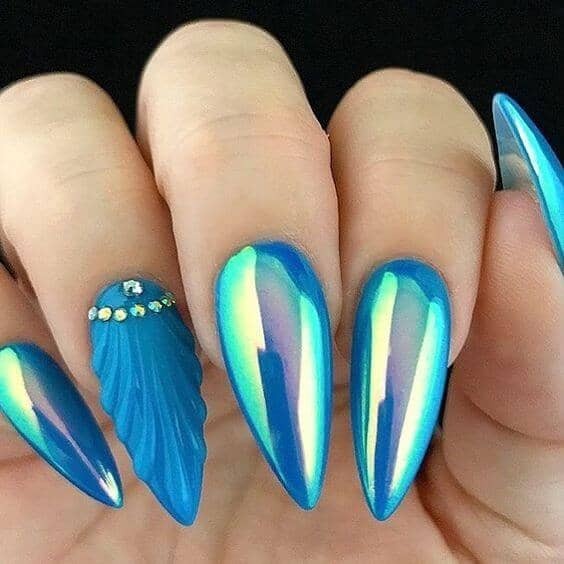 This nail art screams outer space and extraterrestrial vibes. If you look closely, you will notice hints of purple, green and even blue tints to this beautiful silvery hue. 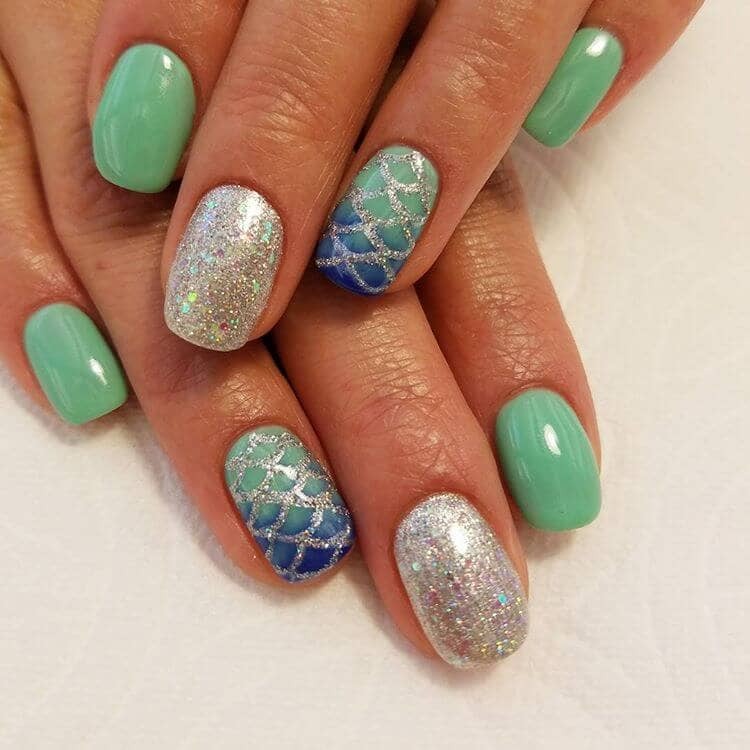 With a classic look of fish scales over a fun ombre sparkle nails ranging from a dark mint green to a beautiful blue, anyone looking for a smaller nail shape with flat tips that won’t get in the way of typing (or picking simple things up) will really enjoy these! There’s a touch of shiny silver nailpolish outlining the nails. Using a mix of both metallics and very basic purples, this cute look is done in coffin shapes and looks regal across all five fingers. While the reflectiveness of the outside four fingers make this look appear quite edgy, the ring finger will feature a very simple purple-toned base with small dashes of darker purple making subtle designs over gems. Both futuristic and classy, this simple yet intricate nail art is a perfect addition to any party nails, and can even be worn more casually if you’re okay with metallic shades. All five nails are reflectively metallic and show hints of primarily blue, teal and of course, purple. 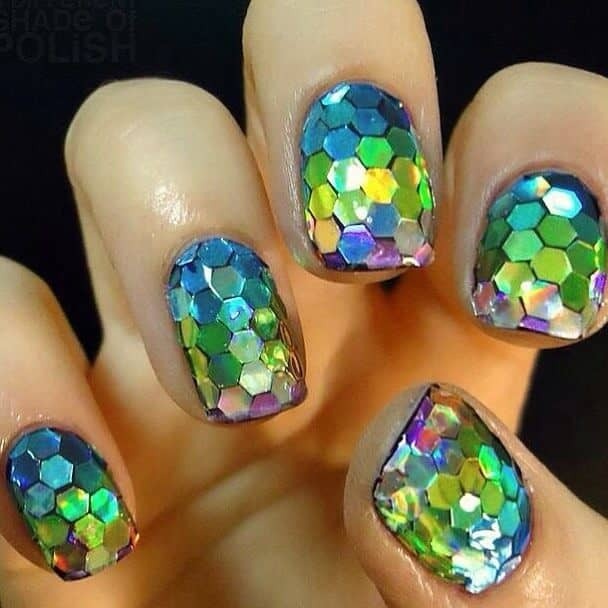 The ring finger has white outlined fish scales to decorate the nail. 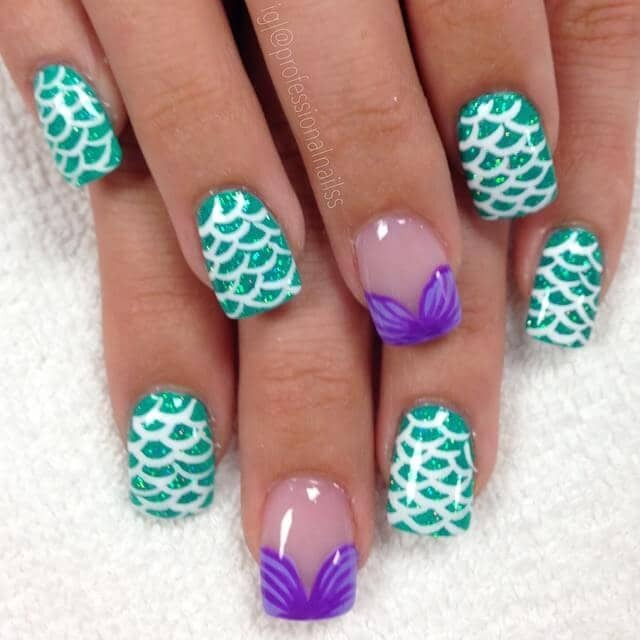 This nail art creates a fun color range from mint green to a barbie lipstick pink. 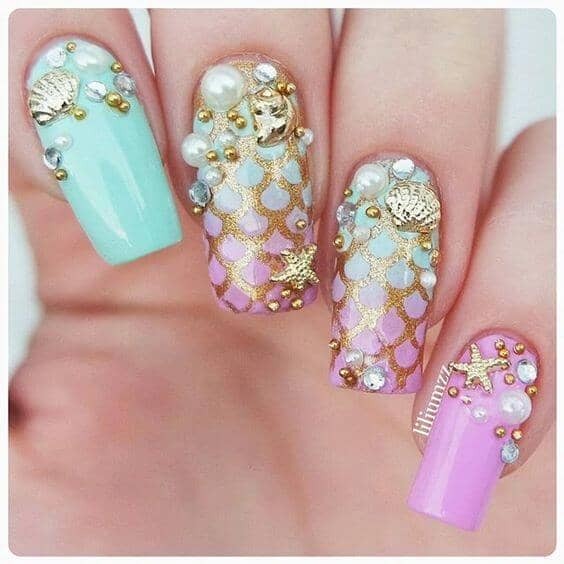 Embellished with multiple seashells themed gems, including different shape pearls, stars, and colorful, shiny balls, these longer nails leave a lot of room for decoration and creative control. There’s a gold accent in the fish scale outline on both the middle and ring finger. Nearly resembling a festival inspired theme, these long nail design will have you swooning once you see the stunning use of gems on both hands’ fingers. The gemstones are reminiscent of a South Asian styled bindi and make for a great accessory to what would have otherwise been a plain lavender nail. The range of designs is versatile. 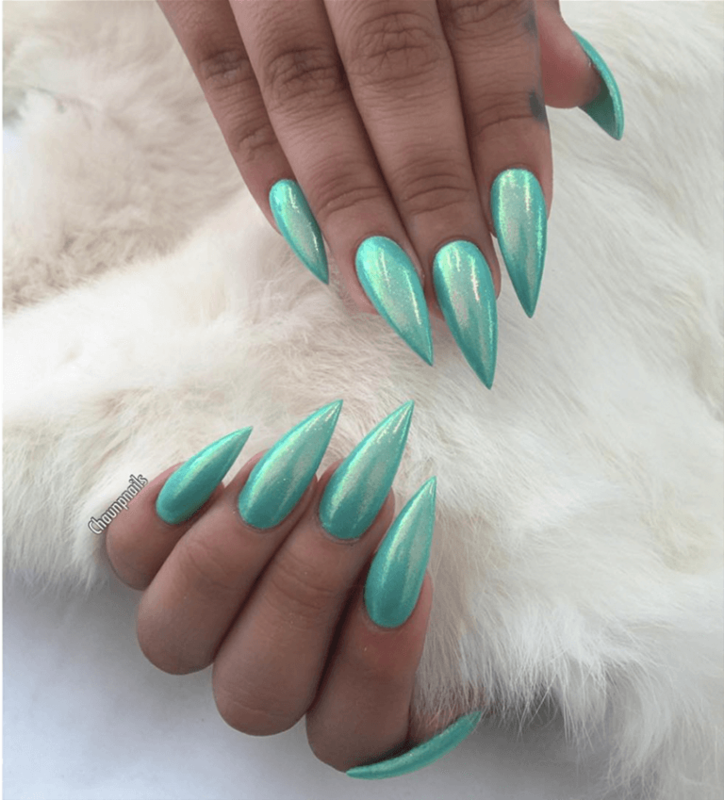 At first glance, these nails look a tad bit scary with their very, very pointy tops, but the sparkly and vibrant mint green will help ease the intimidating shape of the nails themselves. You can sport these to a Halloween party or even a friends graduation party… just be sure not to poke anyone or potentially hurt any small pets. This nail art has a very basic coat of black nail polish on two of the outer (long) fingers by using an all-black base for nearly half the look. if you’re a lover of all things black and find the color to be as classy as we did, we know you’ll likely love this mermaid design and embrace the small switch. Similar to a previous cute nail art that featured a variety of nail art all within one look, this particular nail art has the same three sets of fingernail art on each hand. Both the outer fingers on each hand are gold with a gorgeous arrangement of gold and white miniature pearls adoring the surface. The next nail has glitter! Have little kids around? In need of some entertainment for them? They probably love rainbows! I mean, what kid doesn’t?! 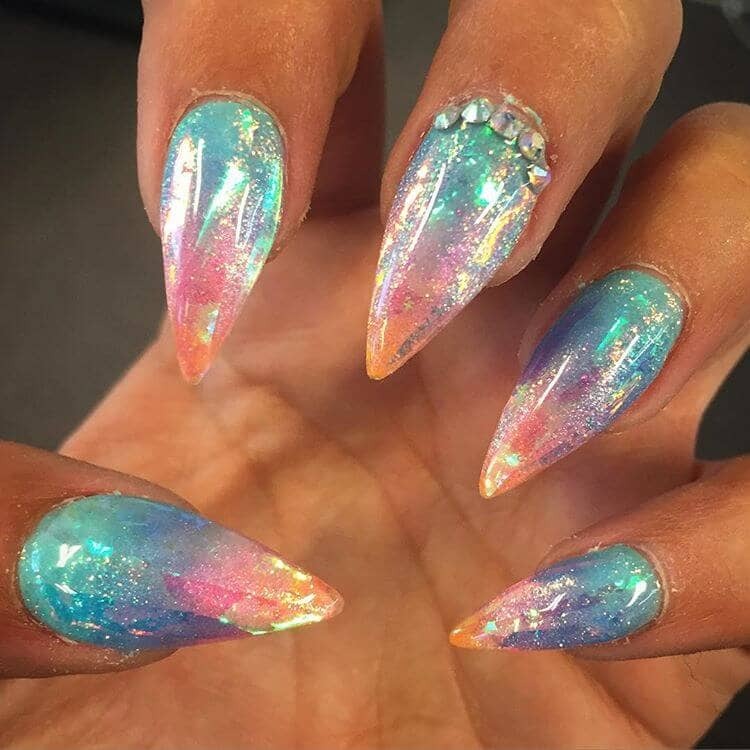 These colorful rainbow nails have a different ombre color on each nail. With such a wide selection of colors ranging from yellow and orange to green and pink, younger audiences will love trying these nails out! Adults can join, too! 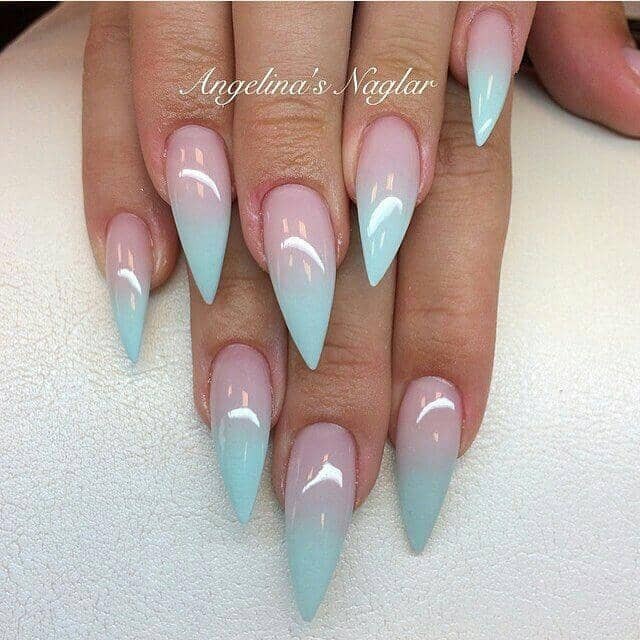 These awesome mint green and pink ombre nails almost resemble the yogurt we’d all have as kids! Look familiar? The one difference is the addition of the pointy nail shape. Overall, this look is actually quite simple and can suit someone who may not be used to experimenting with their nail art. Anyone looking for a change can try this! Nowadays, everyone browses Pinterest looking for the next trending design to try on their nails and share with their friends! This blue, intricate nail art resembles gemstone treasures found in a cave. With an uncanny resemblance, you will feel luxurious just wearing this gemstone-like design. 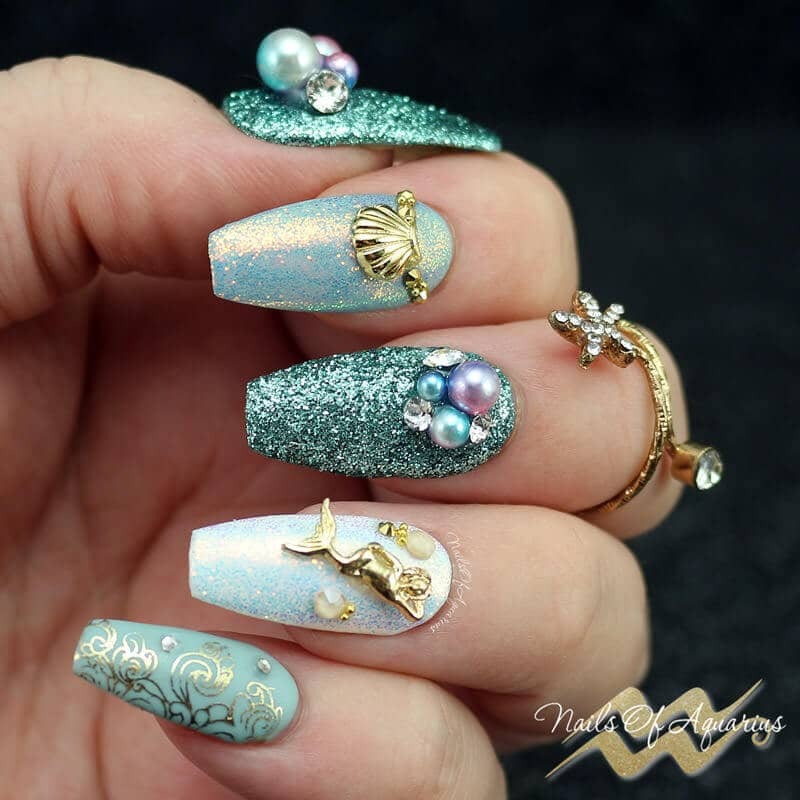 The ring finger has a gorgeous seashell-esque look to complement the metallic. This look’s an unusual and varied nail art with a different design on each nail. 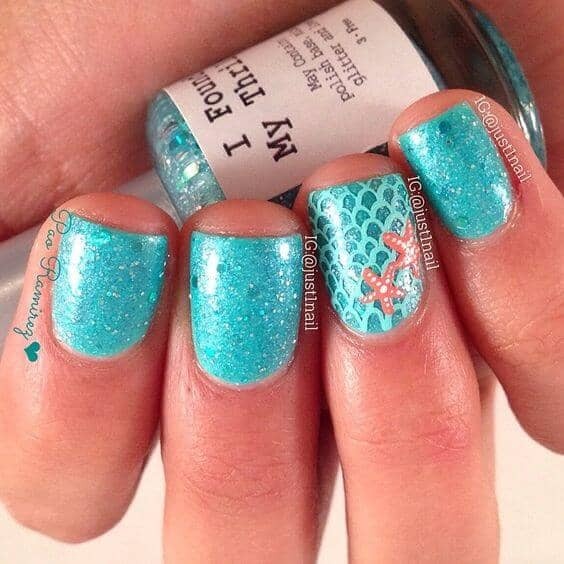 On the thumb is a fun combination of a reef-like imprint and a touch of glitter. The pointer finger is a stunning dark green to lime yellow ombre scaly design. 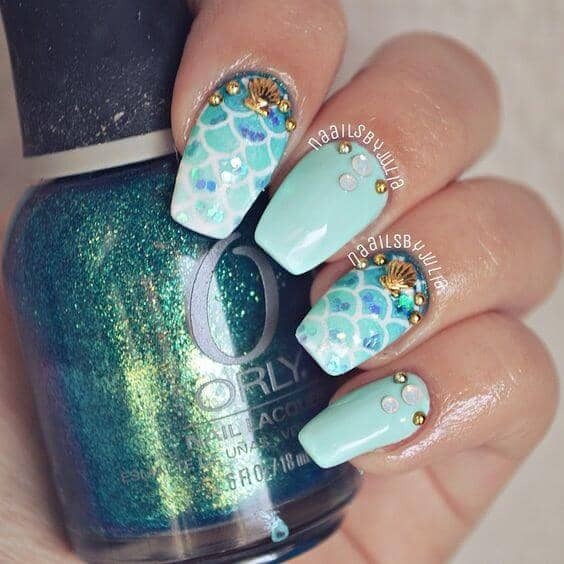 The middle nail has a fun fish with a gem representing its head. How fun! This set of designs is a lot less quirky than the last. To begin, these nails are short and what most people would consider “normal sized.” There’s a uniform teal used across all five nails. Four are the same and have white fish scales outlining the whole nail, whereas the ring finger includes a unique type of buildable, transparent glitter. Know a festival aficionado? A perfect suggestion for them could be these nails right here! With a blend of both baby blue and light pink tones, this easy nail art will go along great with any light outfit, such as a white shirt. In fact, there are henna-like designs on the pointer finger and the pinky! Seashell nail added. If your favorite color is green, these nails are a perfect statement nail look for you! 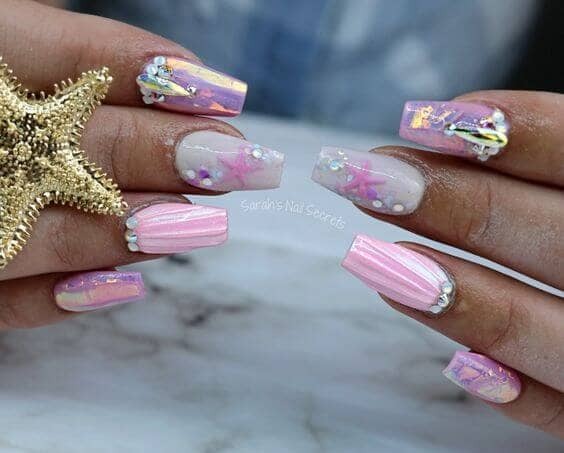 With the most gems and embellishments of all the above-mentioned nail art, these nail styles don’t look particularly easy. Getting the right nail color can demand a lot of focus from the manicurist and a lot of patience from you to get the job done. 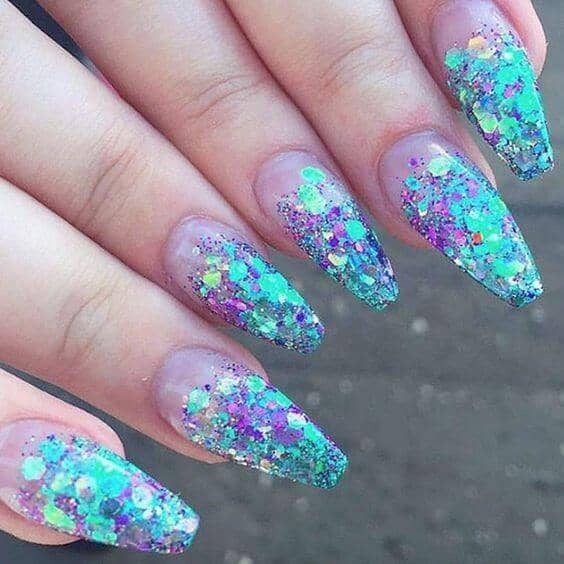 These nails resemble an expansive universe or galaxy. Reminiscent of the sky and a summer sunset, these fairy dust nails are likely to remind you of how beautiful our environment is. 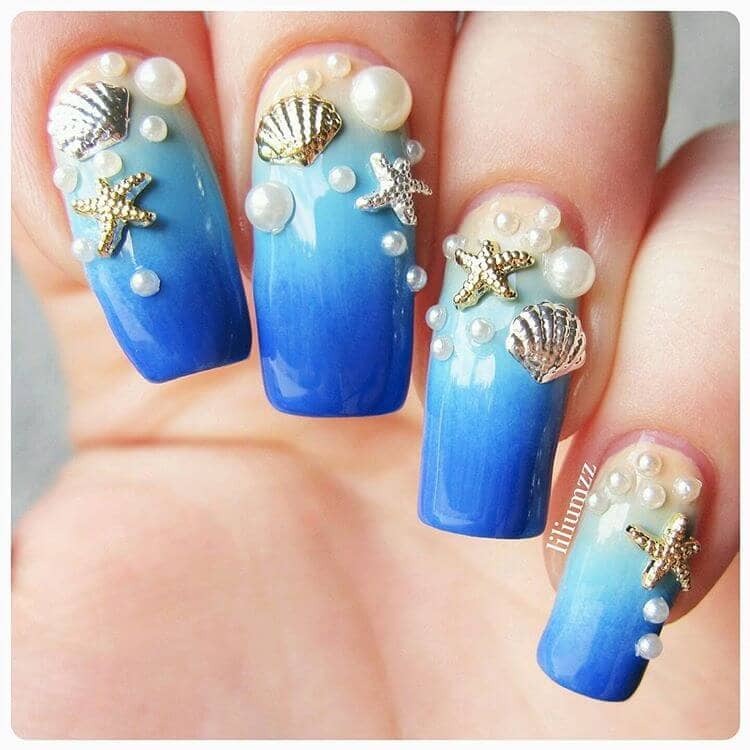 The middle fingers are all white seashells with a small gem at the bottom, adding a stunning statement to the entire look. There’s even an added touch of glitter! While most people have certain preferences, there are some universal and classic themes anyone can try. This look is one of them. The very short and one-toned nails must be quite easy to create. 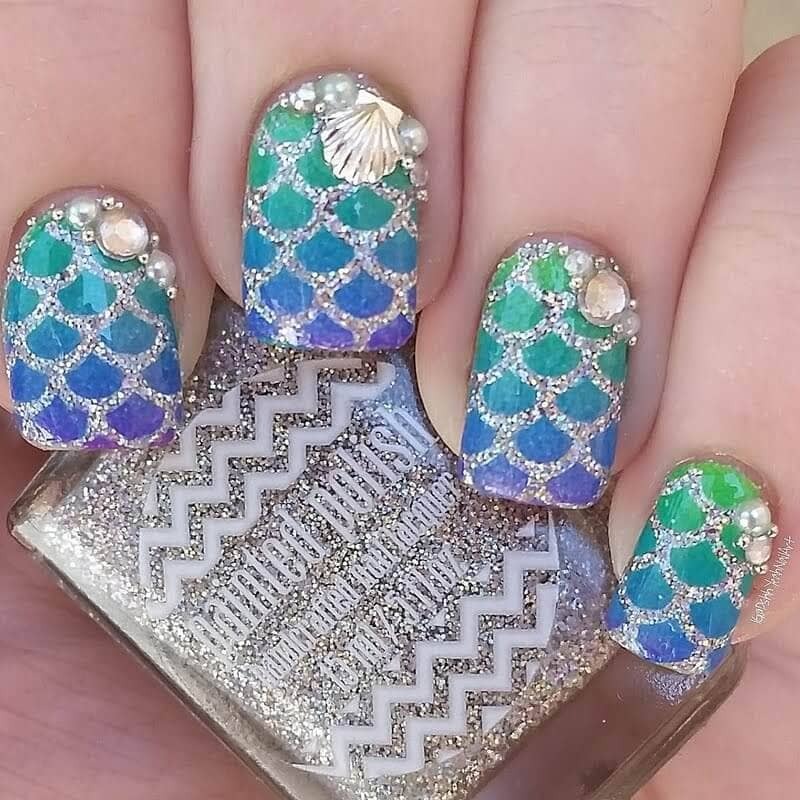 All the nails except for the ring finger are the exact same for this mermaid nail powder design. This manicure type is similar to the last. Four of the nails are the same, excluding the ring finger. The ring finger has the best design. 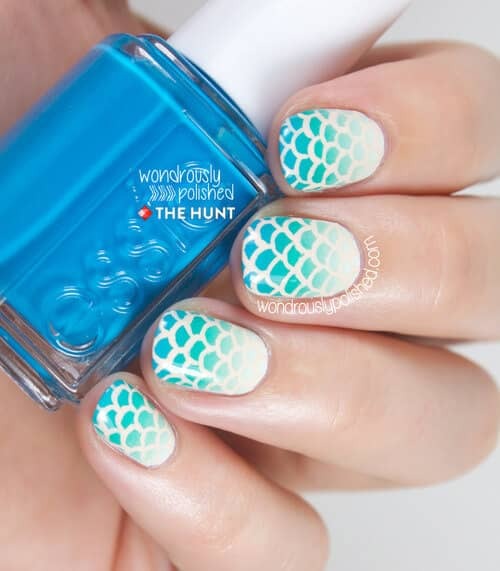 There is a simple yet cool outline of fish scales over the coral nail itself. This lively set is a great addition to whatever manicure you choose. 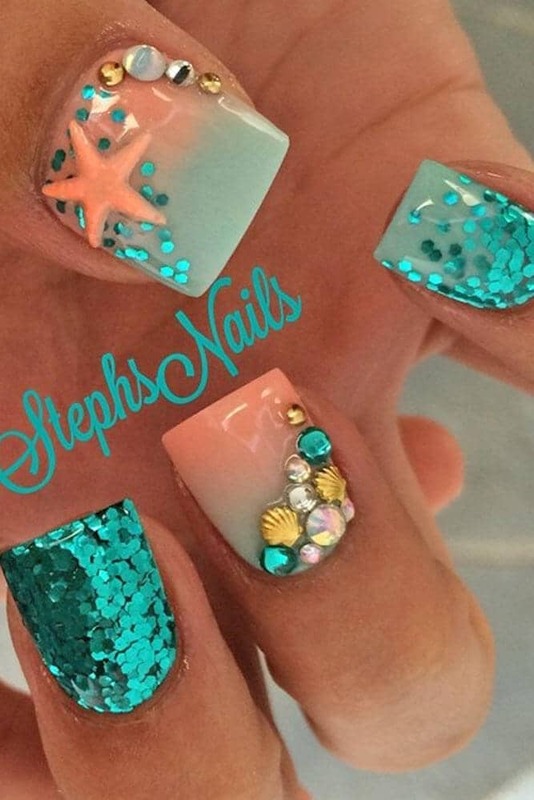 Nail art looks a lot like the viral manicure photos you see on social media. Most bloggers have tried this sort of nail art and posted it in their feet at one point or another. With beautiful gold incorporated into the design, the pale pink is beautifully complemented with a subtle hint of glamour and trending Instagram fulltime blogger vibes. Nail art looks very Cosmic and resembles something out of a National Geographic documentary or Magazine on space. If you look closely, you’ll notice a rainbow ombre. The nail shape is very pointy. There is no yellow at the top and blue at the bottom. On the middle finger, there are gemstones across the bottom of the nail. This mermaid nails powder art looks very cosmic and resembles images out of a scientific nature documentary or outer space film. If you look closely, you’ll notice a rainbow ombre. The nail shape is very pointy. There is no yellow at the top and blue at the bottom. On the middle finger, there are gemstones across the bottom lining of the nail bed. This is a stunning 2018 new age combination of lime green and sea green ombre. This magnificent ombre really highlights the lime green. In fact, the middle nail is entirely lime green with a touch of a small gemstone. if you’re wondering where the sparkles are, don’t worry. 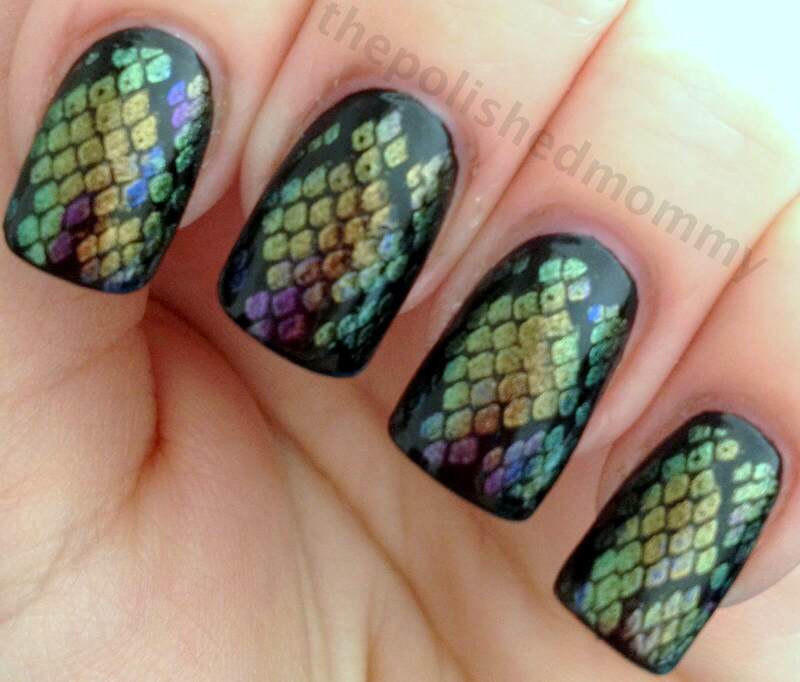 There’s a gorgeous golden fish scales outline adorning the green ombre. At first glance, the design resembles the scales of a snake. 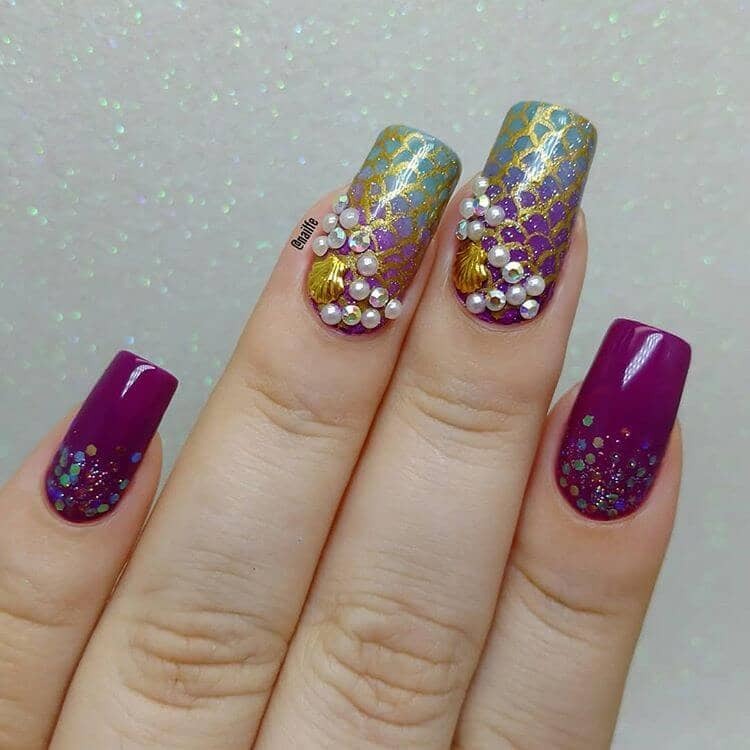 With a more hexagon like shape, this fish scale outline stands out in comparison to the previously mentioned nail options. Unlike the other options, the ring finger is the only simple nail bed with a plain purple coat. The other four nails are where the magic happens. How beautiful is this blue?! 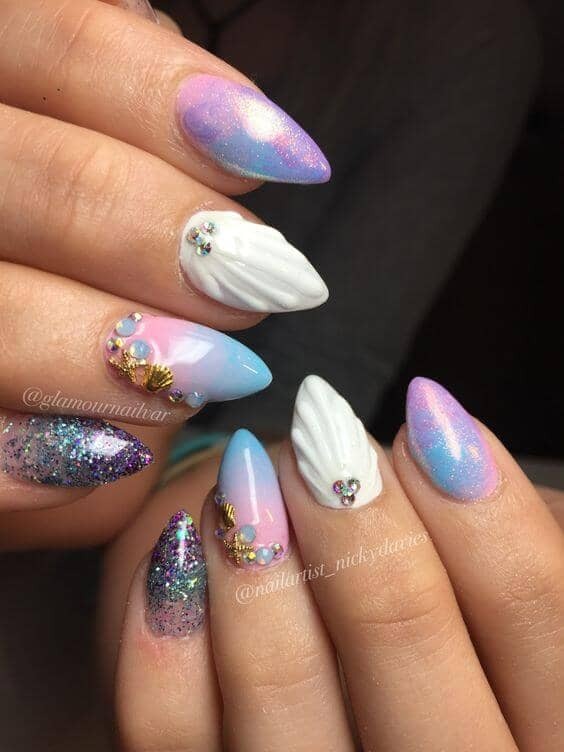 These creative nails look as though they came straight out of a blogger’s Instagram feed. The light blue perfectly reflects light. 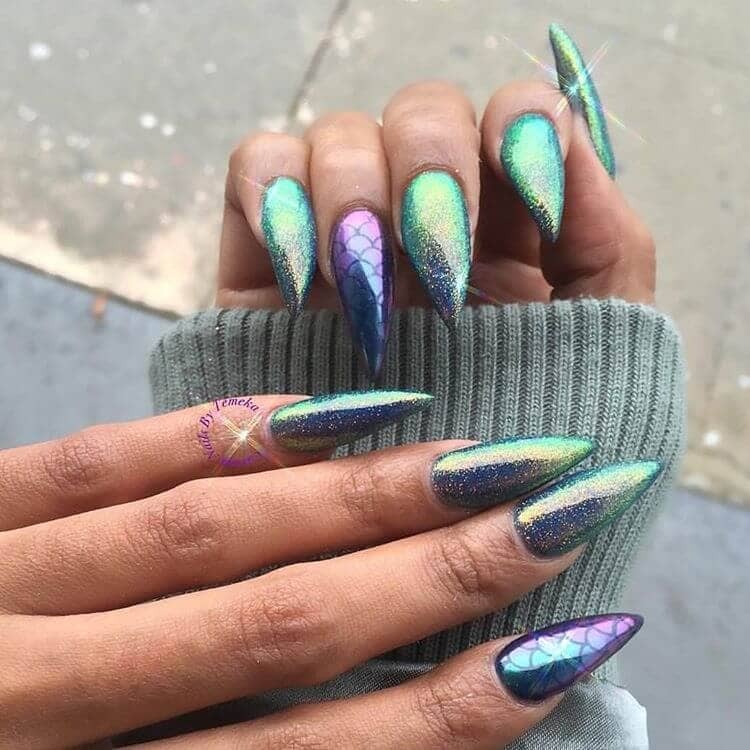 The shiny, metallic quality of the nail polish is great for not just natural nail beds, but also the best artificial nails if you want something simple yet spectacular. There are so many shiny details! This sea green ombre design is quite similar to the former design described, only the patterns are in a different style. 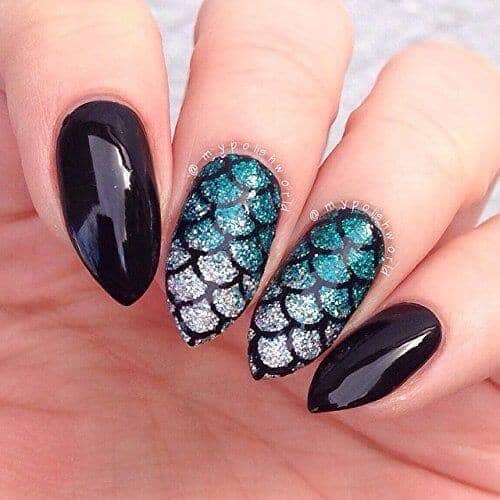 With this design option, the fish scales template is far larger and more spread out in comparison to the smaller scales on the other set of nails. The ring finger is still the simplest finger shown. 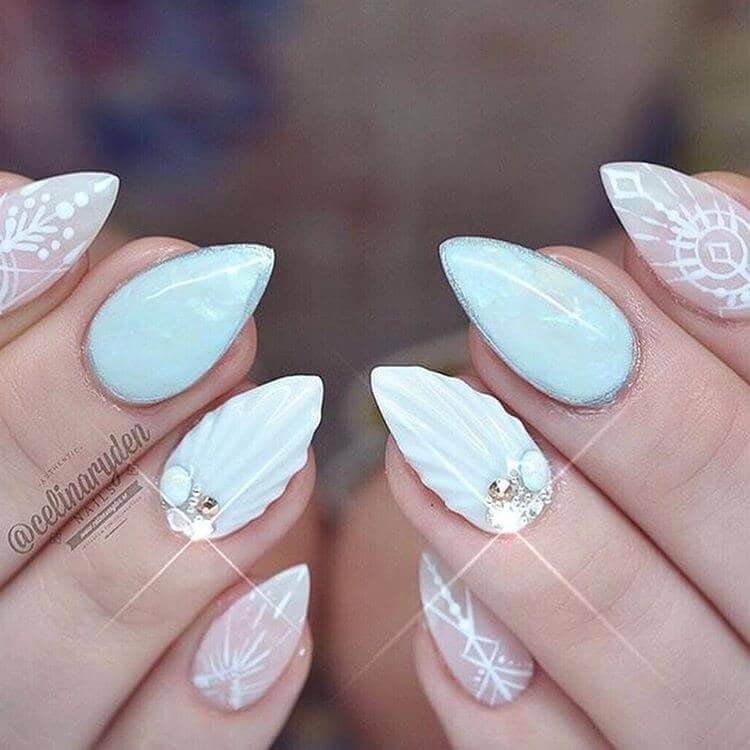 This particular nail art design is great all year round, but can be especially great during Christmas. Since it incorporates both a shiny, glittery silver and a mint green, this look screams Christmas! 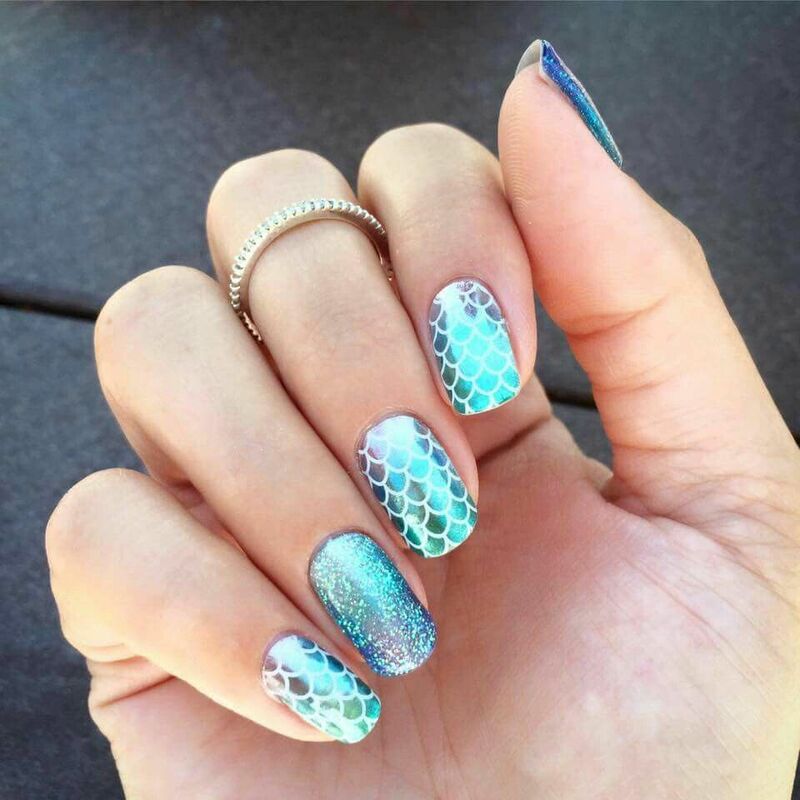 The mermaid design of the fish scales falls beautifully over a blue to mint green ombre on the ring finger. This displays such a versatile design arrangement. This nail art design is probably the most elaborate of the bunch. With very large coffin nails and shimmer on each and every nail, these nails are sure to be an attention grabber. You’ll be the talk of the party with everyone questioning how on earth you got those golden rhinestones on your nails. The gold is shimmery and shiny. 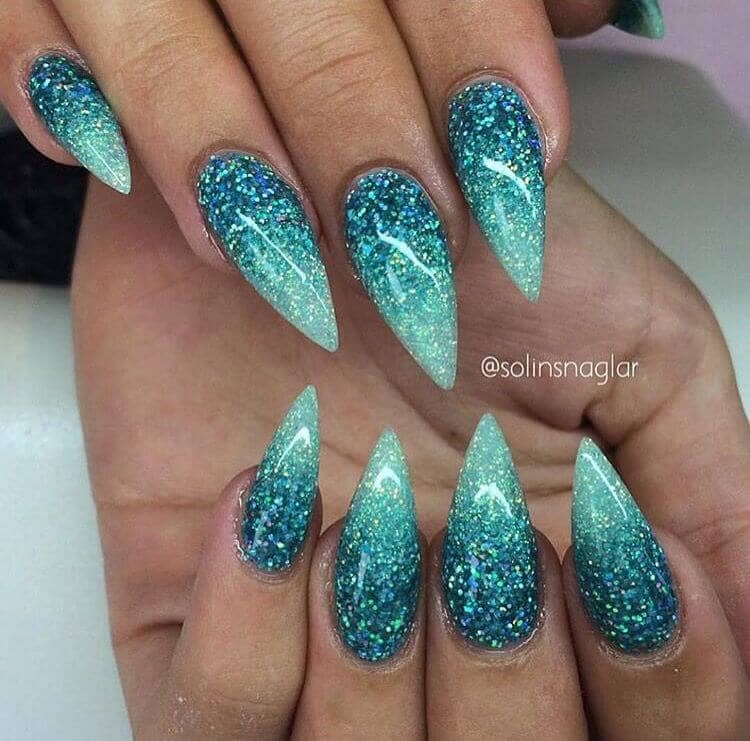 Doesn’t this set of nails remind you of Ariel the Little Mermaid? 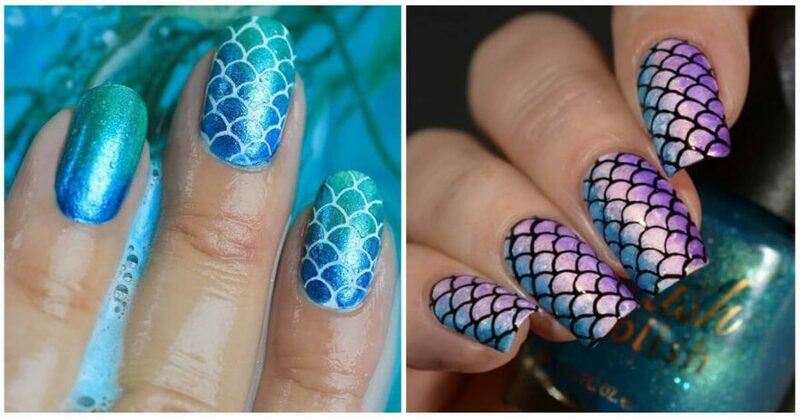 With her famous purple top painted across the middle nail bed on top of a clear polish, you can practically hear ‘Under the Sea’ playing in the background. The rest of the nails are a fun opaque teal (not shiny) laced with mermaid fishtail scales in white. 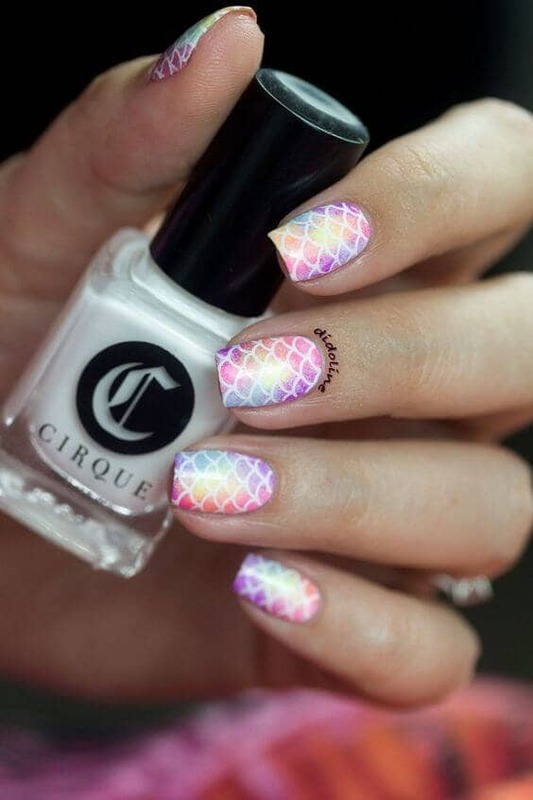 Did your eyes widen at this particular nail art design? There’s no shame in admitting that there’s a spooky touch to these nails. The dark green and purple hues really give a grim tone to the already very sharp nails. 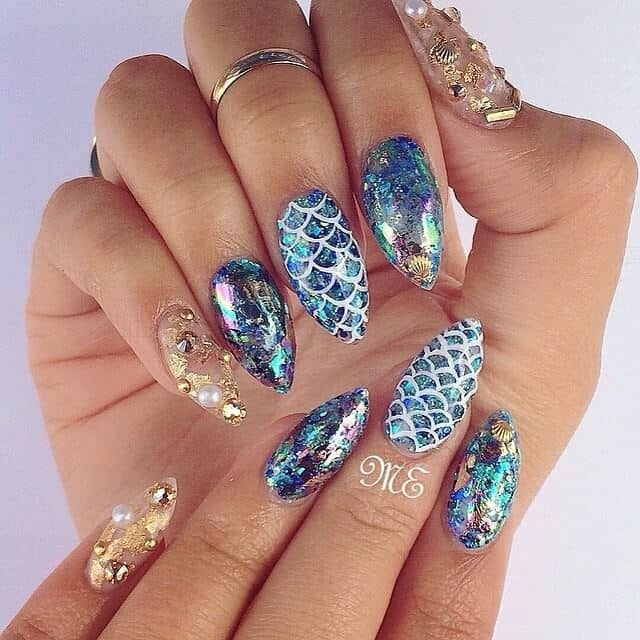 The transparent mermaid fish scale print can be spotted if you closely look at the pointer nail and ring nail. Remember the coloring books you’d beg for as a kid? These 90’s style nails are both short and fun to recreate. 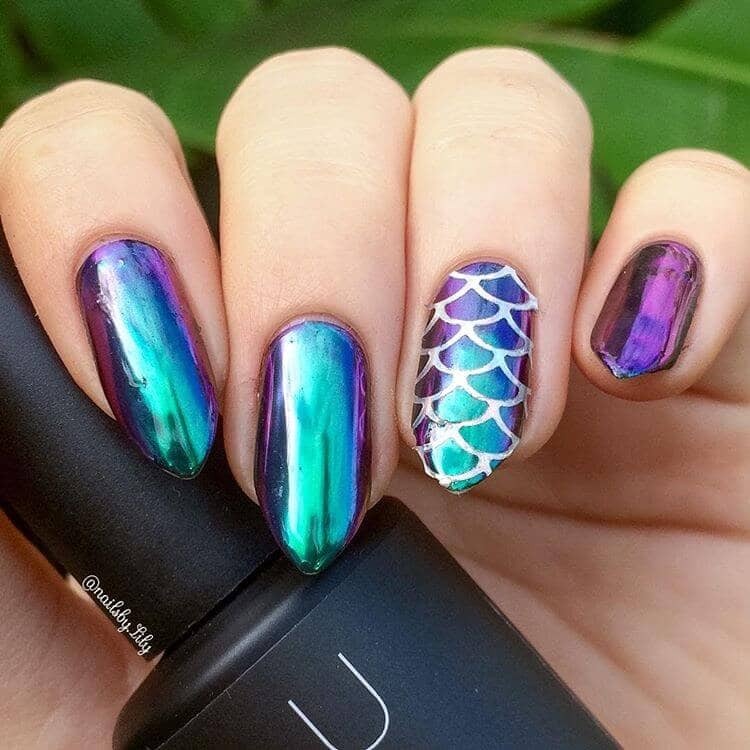 The rainbow tones will require a bit of effort to properly blend and apply the nail polish itself, but once you do that and add a print of the mermaid fishtail scales, you’ll feel transported back in time again! 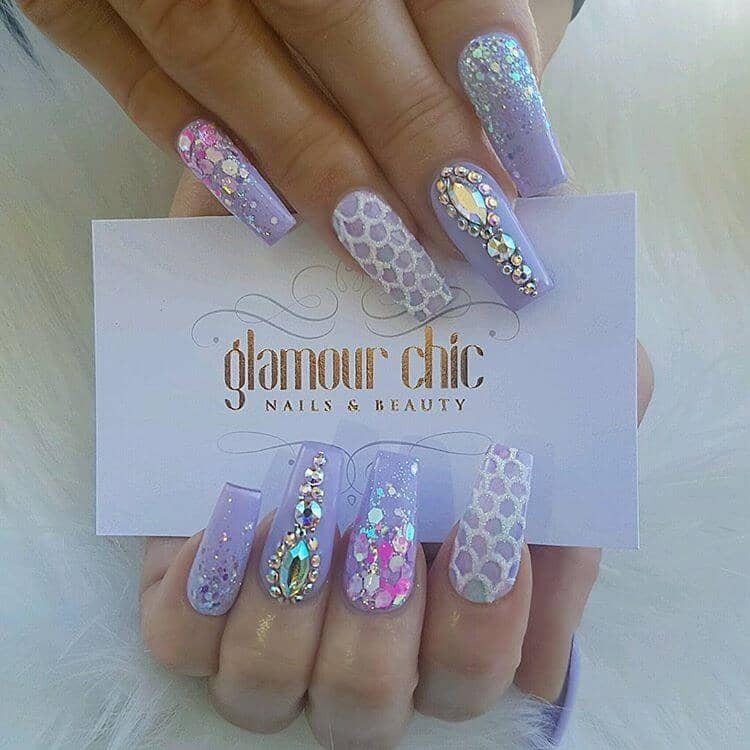 With such a well-done design and placement of the hexagon shaped glitter, it’s hard not to admire this nail art. There’s an ombre in the glitter itself! You can see tones of royal purple, midnight blue, mustard yellow and a nature like green. In a way, the ombre almost resembles a rainbow with all the stunning colors it holds. 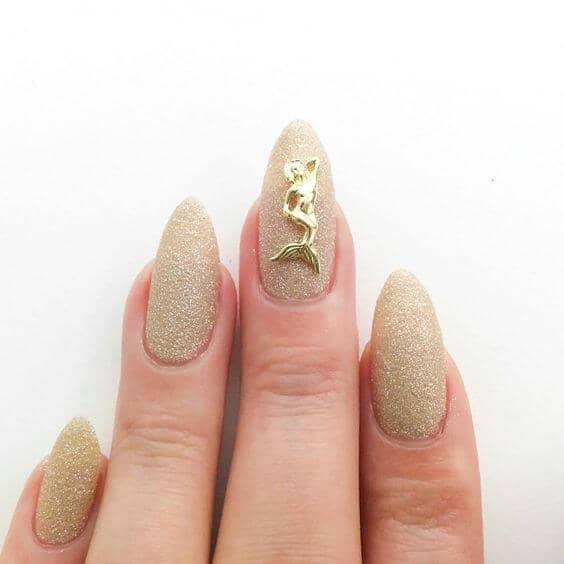 This nail art has a very, very pointy tip. Not everyone prefers really pointy nails, but this nail art is still applicable to other shapes of nails. The design itself almost resembles a galaxy during the daytime. With a light blue, it appears as though there’s a solar energy at the center of the nails when interlocking your fingers. This nail art appears to have the shortest nails of the entire list. There’s a lot of glitters packed into each nail despite the small size. The colors are just gold and a muted blue. Each nail has some hint of gold sparkles in it, making this look really glamorous. Both hands also contain fingers embellished with rhinestones and gems. This nail art is definitely the lightest of the entire list. The majority of the look is in a Tiffany blue – yes, like the diamonds and jewelry company. There are also hints of gold gems at the bottom of the pointer finger and the ring finger. Look closely and you’ll see tiny pearls, both white and gold decorating the others. Ever wanted to attend an Indian wedding? Now, you can feel like you’re getting ready for one with this beautiful, silky smooth look. 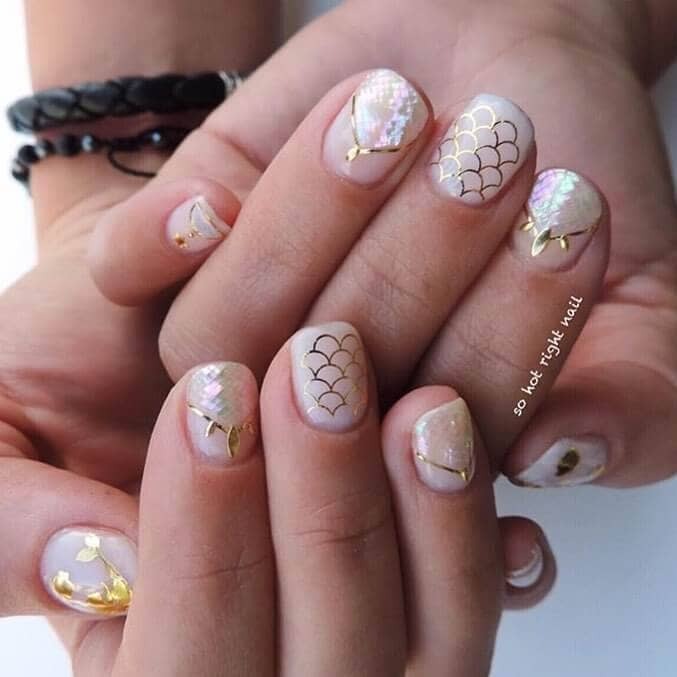 The middle and ring finger consists of small pearls, gold gems, and a light but the shimmery lattice of mermaid tail scales. There’s an ombre from green to purple. The other fingers are maroon for the most part. A pink and white candy cane design? Who would’ve thought that would make such a cute nail design? This look has a little bit of everything – you can find your metallic, shimmery nail polish on the pointer finger, with some rhinestones of course. The middle finger is plainer, and the ring finger, of course, has a pink candy cane design. This set of nails resembles a Morrocan temple and has “Arabian Night” written all over it with its silver gold blend covering four out of five fingers. 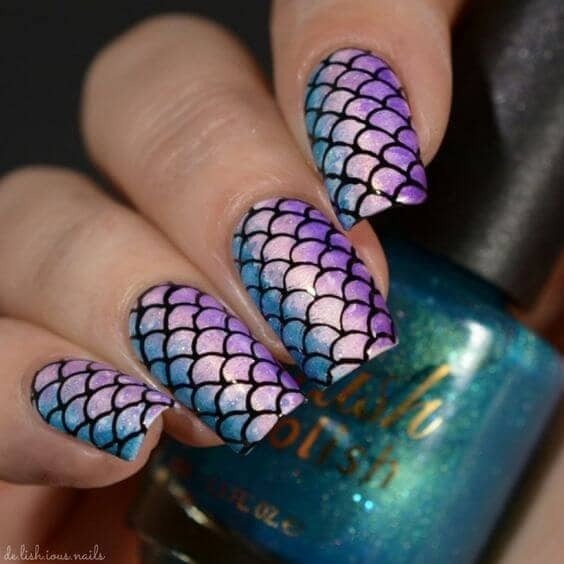 The middle nail is the one that contains the mermaid tail scales lattice design. The tail scales lay over a very opaque baby blue (not shiny) solid color base. Try it. Feel regal! How pretty is this striped, bedazzled nail art? These are sure to capture everyone’s attention with how pigmented each color is, especially the magenta. Have you ever seen a more royal blue? The deep shade of blue looks incredibly vibrant and is beautifully topped off with gold embellishments and designs. Attaching these smaller stars and seashells really help complete it. Do you know a snake lover? Or maybe someone who’s absolutely terrified of snakes? They might appreciate this Cobra skin like nail look. (Either that or they may yell at you for taunting them with snakeskin looks.) With a dark black outlined edge and a golden, greenish metallic center, this design almost looks lifelike and resembles a Cobra. How lovely is this Pinterest style nail look? The assembly of gems and smaller stones really give this look a unique edge. 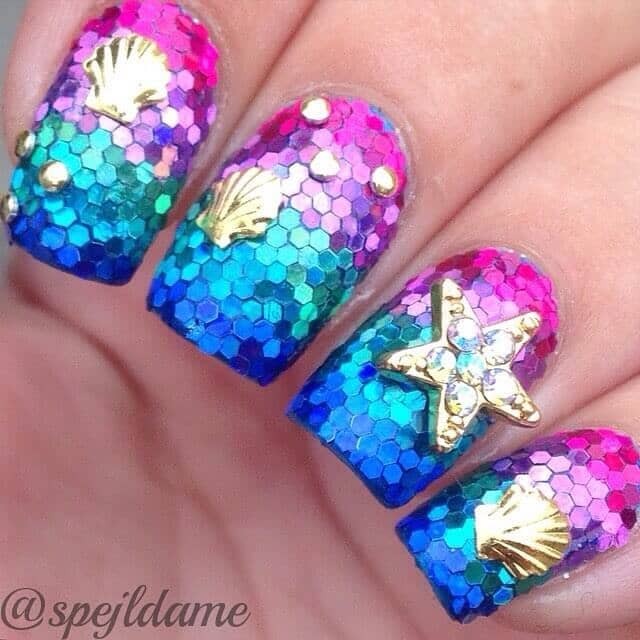 You usually see just a star here and a seashell there, but this look puts one of these gems on every single finger. The blue to light apricot ombre truly resembles the view of a beach afternoon. This look is interesting for a couple of reasons. Firstly, the nail polish held by the subject appears to be a different color than the one painted on to her nails. Also, these are the most consistent and uniform designs, taking away the variety of nail options. It’s is, however, hard to tell whether the color is actually green or blue. Emerald is a stunning and often underrepresented color. These nails are great for anyone who wants to create a uniform experience for the first few sign ups! 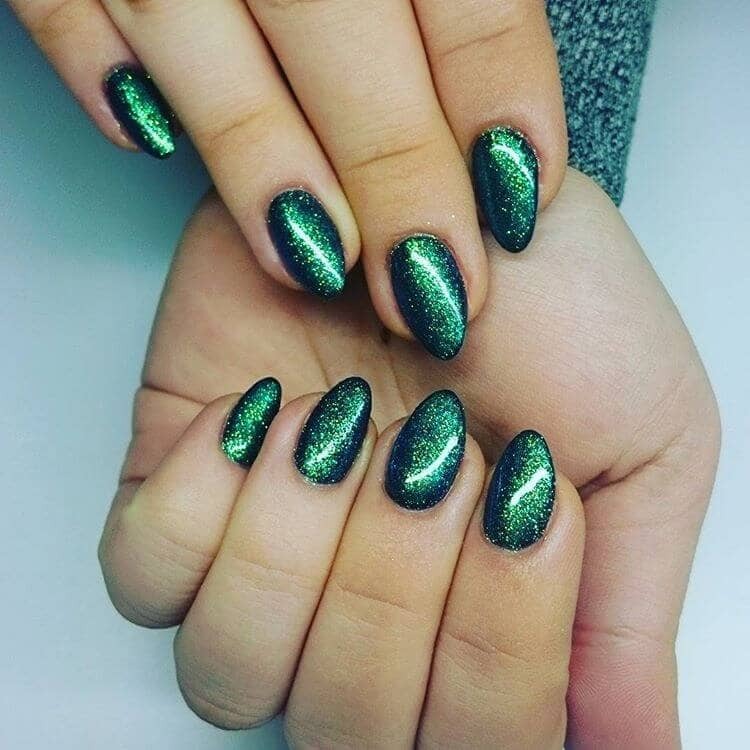 The nails in this look are metallic green which could be perfect if your eyes green too. If you match the color of your nails to your eye color you will look more fabulous. 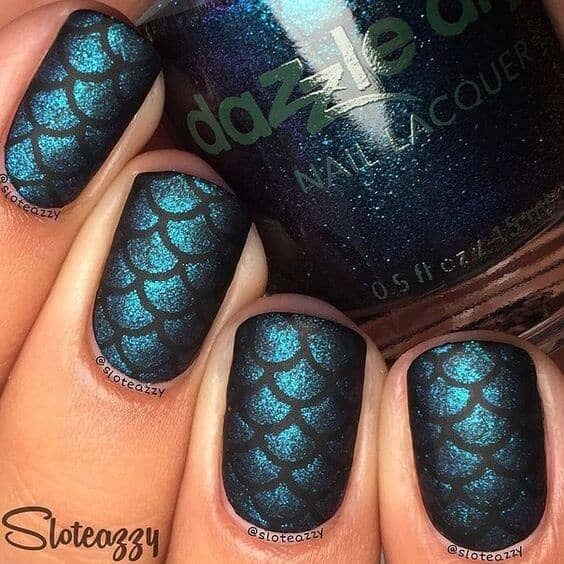 This metallic nail design of this fine and grainy teal glitter, with its beautiful vignette and black outline, is pretty awesome and could satisfy a large audience. This look is so distinct that it can easily be recognized almost as its own trend. 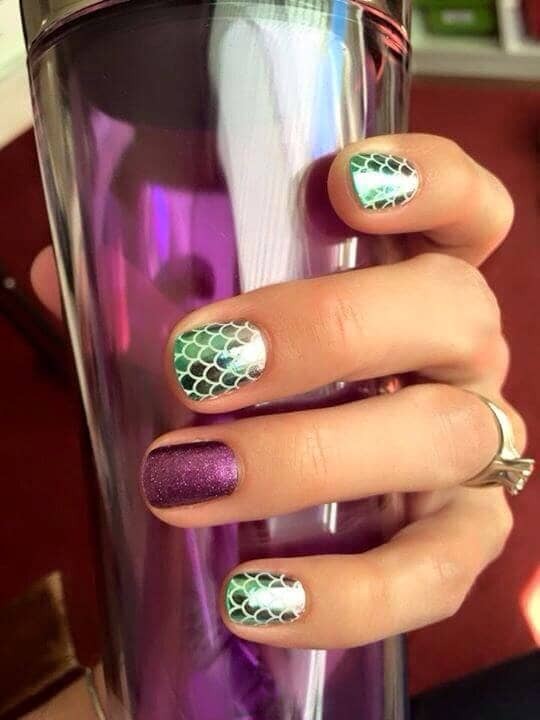 The mermaid tail scales lattice are the focus of the look and really add much-needed definition. There’s something special about this particular nail art in comparison to the rest of the designs. 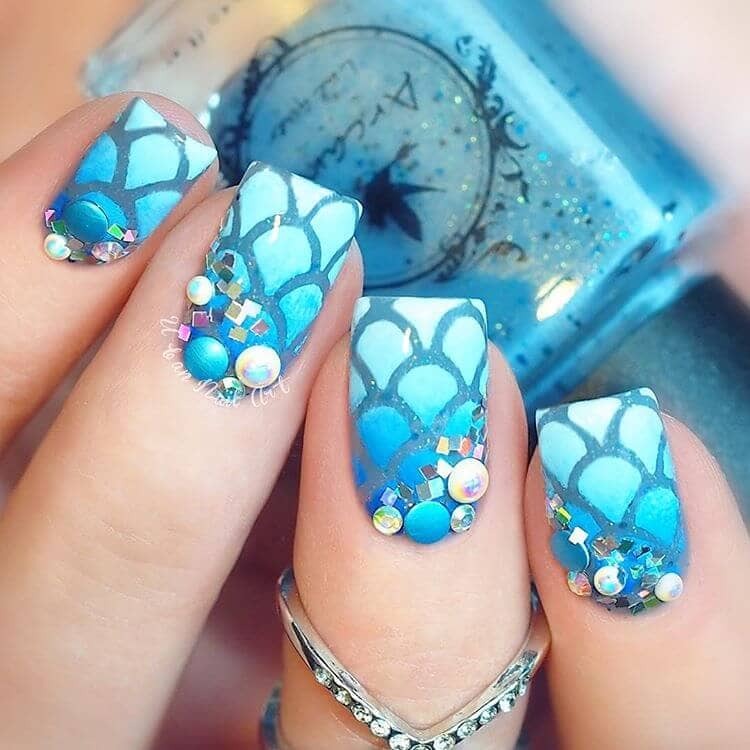 While the other nails have a mermaid tail scale lattice that is either sparkly or one made of black nail polish, this look uses an all blue color palette to reinforce its ocean theme. The top is sky blue and fades to ocean blue. This look has all the sparkles a girl could ever dream of! 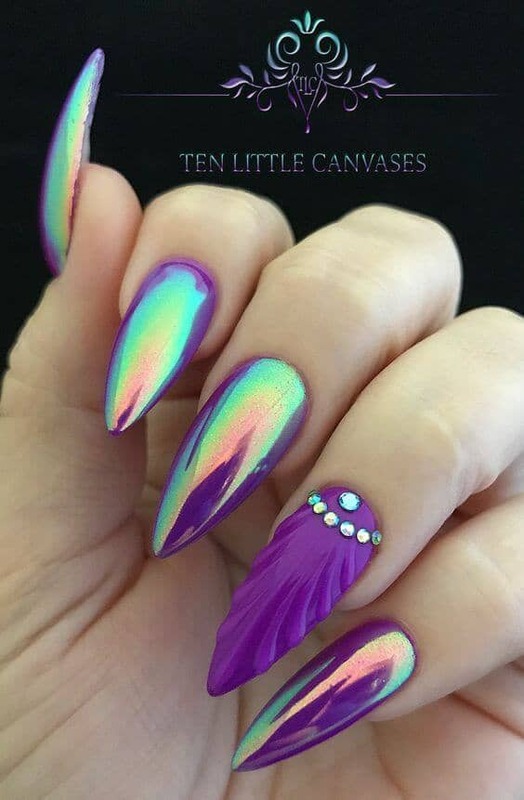 With magenta to purple to midnight blue sparkle ombre, this design shines beautifully, especially when held in front of a light. As if that wasn’t enough sparkle, there’s also a mermaid tail scales lattice layed over the shiny ombre in a beautiful glittery silver. Talk about glitter mania! Resembling the grainy consistency of a hot, barren desert in the Middle East, this subtle yet luxurious feeling nail look is great for anyone who likes a small touch of pop. There is a single gem placed on the middle finger. 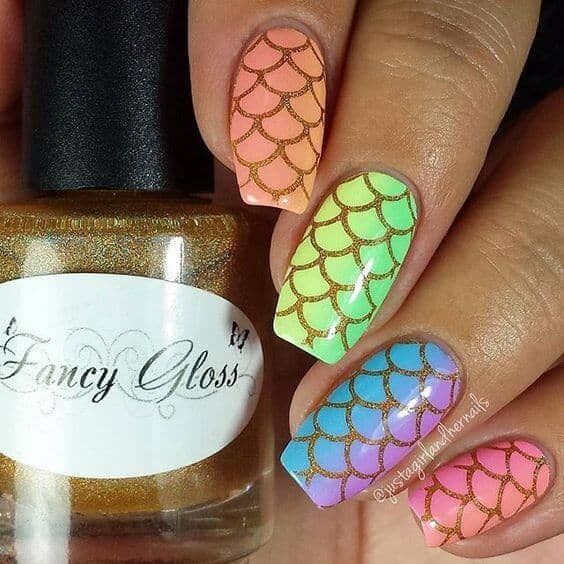 This golden fish like gem is the focus of this beautiful look. This is great for a big party. Do you know a nail addict who’s looking for the best artificial nails and would love checking out a new nail trend? You should send them this blog post and make their day with an overload of Pinterest worthy nail inspiration! With so many different options, they’re guaranteed to find a style that suits their personality and needs. The versatile range of nail art really runs the gamut and can cover nearly any event or special occasion, whether casual or upscale. Perfect for dinner dates, nights out with the girls or even just a fun pick me up to practice self-care, testing out new looks can be a great way to embrace self-expression.